I made my own oven dried tomatoes this week! It's time consuming but not much work at all. I started with a bunch of San Marzano & Roma tomatoes which I sliced in half & put cut side up on baking sheets with a silpad on them. I salt the tomatoes with a little kosher salt. 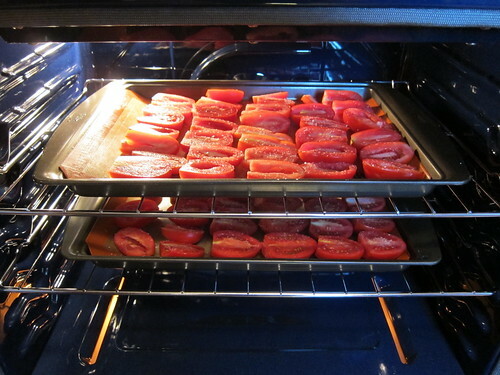 Then they went into a 200 F oven until they were leather pieces of sweet tomato. You want them to be pliable but not juicy anymore. The San Marzanos tended to be smaller with less of a juicy inside, they dried in about 8 hours. The Romas were larger plus quite full & juicy. They took a lot longer to dry, closer to 12 hours. I found I had to keep checking after 7 or so hours & remove the tomatoes as each one was done because of the different sizes. I've frozen them to add to pizzas & such through out the winter. Seems a little sad that all those tomatoes now only fill a quart size freezer bag but they really pack a lot of flavor. what a process! Anything to preserve summer I suppose. I've been dying to try this. My poor tomato plants did nuthin' this year though... nuthin'! I'll be eyeing up the farmer's market next week. I have always wanted to do this. I think you have given me the push I need. 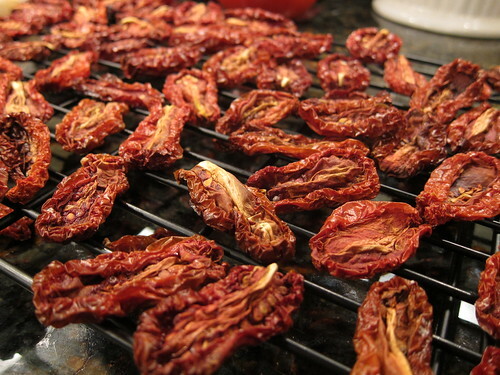 fact: dried tomatoes are one of my favorite things in the world. chewy, sweet but not, and SO flavorful. good stuff. I do this too and with the romas I take some that aren't completely dried through,put them in a canning jar, gently heat olive oil ( not too hot or you'll burn the tomatoes) and pour over tomatoes. Make sure the oil covers them completely and always keep it refrigerated. Great idea, I think I will be doing this very soon. I love sun-dried tomatoes on pizza and in cold pasta salad. This would be very helpful to me and not let any tomotoes go bad. We only need so many jars of pasta sauce....this will work nicely into my life. Thanks! I just tried this grape tomatoes and added smoked paprika to a few and garlic powder to others for a twist. They are a great snack! I always wanted to know how to do this. Thanks!